I am interested in maps as vehicles for narrative. The maps I create describe personal or imaginary journeys. A map is always an edited version of a story, always subject to revision, always open to interpretation, often tempted by exaggeration. 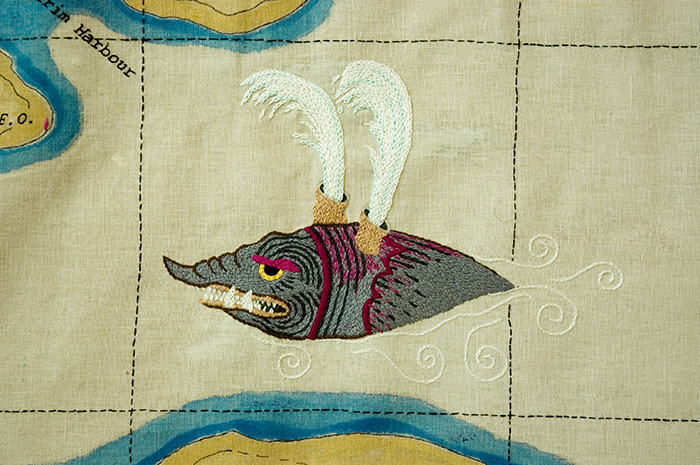 Fine detail and embellishment are the territory of both cartography and embroidery. The Lookout Trail is a map (2016) of a trail I hiked during my stay at Gros Morne National Park as artist in residence. A Childhood in Howe Sound dwells on childhood memories of sailing. 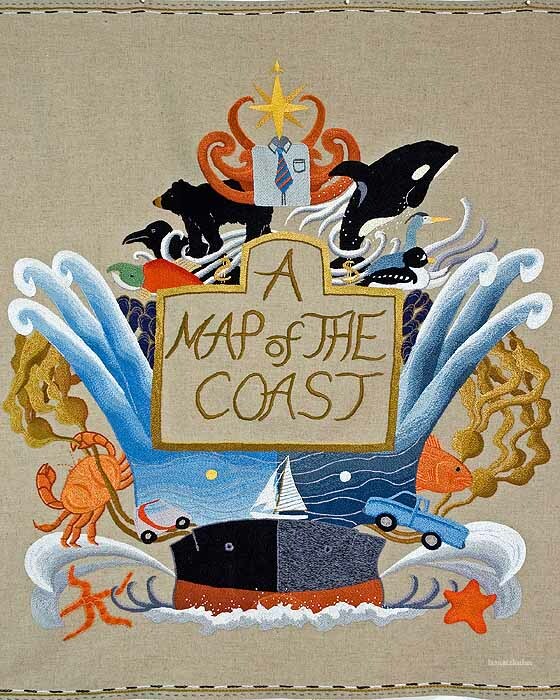 This work (A Map of the Coast 2013) was inspired by old maps whose cartouches (title decorations) are extravagant. Here, it has taken over the map. This map below, "Commute", was made for the "Boxed In!" exhibit in St John's NFLD. It had to fit into a box that was maximum 41 x 41 x 46cm. The map with all the streets which lines the box, traces my bike commute to my part-time job and things I encounter, complete with tiny beads, buttons etc to link to the legend . The accompanying legend became so long, I had to roll it up under the lid and design a sort of contraption to hold it. Viewers were invited to put on gloves and unroll the legend. 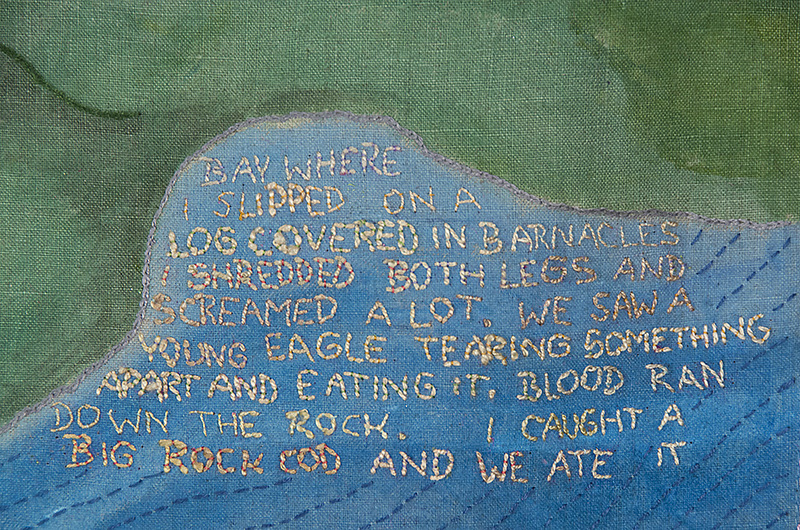 At a residency at the Banff Centre for the Arts in 2008, I worked on new maps made with layers of fabric that describe human and animal interactions, and borrowed from the various legends on mpas. In 1998, as part of a directed studies project for my BFA (Visual Arts) from SFU, I undertook a solo 2300km bicycle trip from the Vancouver area to the Yukon. The Bike Trip Spool was a length of cloth I had prepared in advance, marking 1cm for each kilometre I intended to cover. As I traveled, I would mark off the day's ride, say, 80km (80cm on the spool) and draw what had transpired. Later, after the trip, I embroidered what I remembered best, emphasizing some things and forgetting others....the way memory often works. 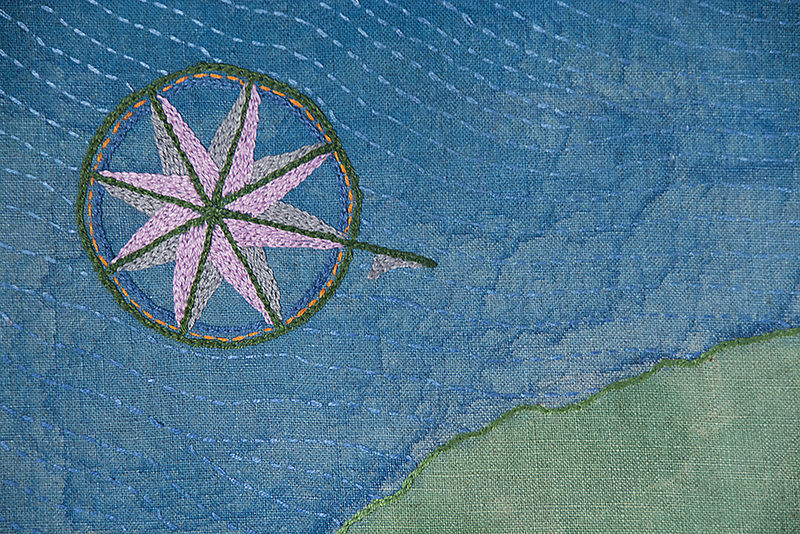 I continue to embroider it. One aspect of the trip that surprised me was how kind people were. Often, at rest areas or campsites or even in the middle of the road, people would offer me food, something to drink, or just cheerful conversation. The Bike Trip Map attempts to chronicle these kindnesses, as well as the condition of the road and my emotional state.